Home / Eleaf / GS-Air 2 Atomizer / iStick Basic / iStick Basic Starter Kits / Vape Kits / Eleaf iStick Basic Starter Kit, do you like it? 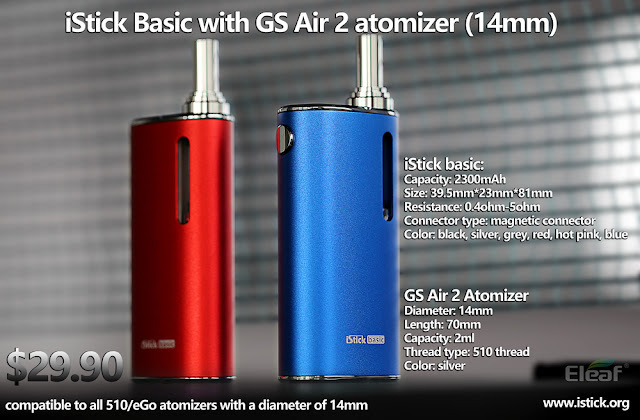 Eleaf iStick basic with the GS Air 2 atomizer(14mm) starter kit. have a large battery capacity of 2300mAh, features its innovative magnetic connector for ease of using with all 510/eGo atomizers of 14mm diameter. With a fashionable metallic appearance, the iStick basic also comes with many attractive colors for your options. do you like it?